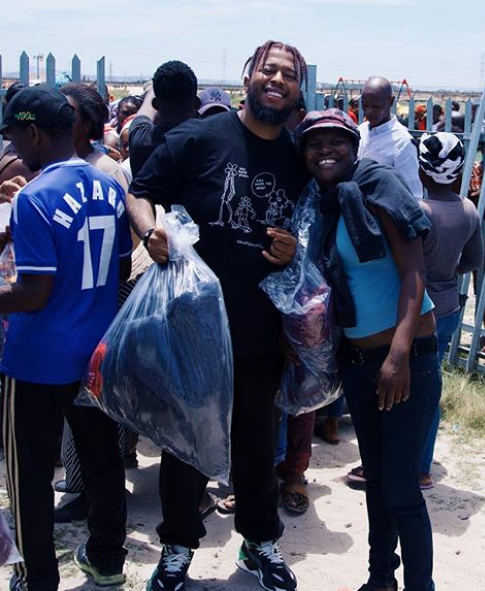 Local singer Anatii has decided to join in on helping out the hundreds of households that were ravaged by the Khayelitsha fire back in October. The rapper, who recently released his second solo album Iyeza to critical acclaim, took some time away from his schedule to visit the affected informal settlement. The Thixo Onofefe hit-maker donated school uniform to some of the kids who lost everything in the blaze. He took to social media to share the video and urge more people to join in on helping out wherever they can. “Khayelitsha we are not done yet! Recently visited abantu (the people) who were affected by the Khayelitsha fire and it broke my heart to see our people living like this,” he captioned the video on Instagram. “Change starts now!” he added, “we were able to help at least 450 households with blankets and clothing packs but that’s not enough! South Africa we need to come together as a country and do more for our communities, I urge everyone to be the change they want to see.